The little orange guy reminds me of StarCom. Or maybe one of those other late 80s lines with really tiny figures, like Sky Riders, Air Fighters or something? The turtle pieces go to the clear hollow guy that you would fill with water. The little figure may go to Zoids . >another small figure. I recognize it, but can't put my finger on it. Hmmmm.... most Zoids can with a tiny, unposable chrome dude, or later ones with a 3" posable one. He kinda looks like Giant Robo. 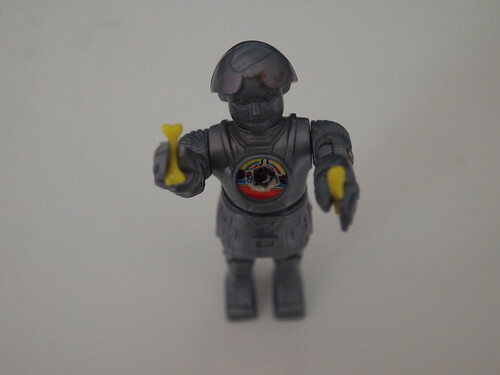 I've seen Kinder Surprise figures assembeled and jointed similarly, but don't specificly recognize that little guy. Ok, couple more thrift shop pick ups that I don't recognize. I'm not being lazy here, I spent some time googling them last night but I got zero. 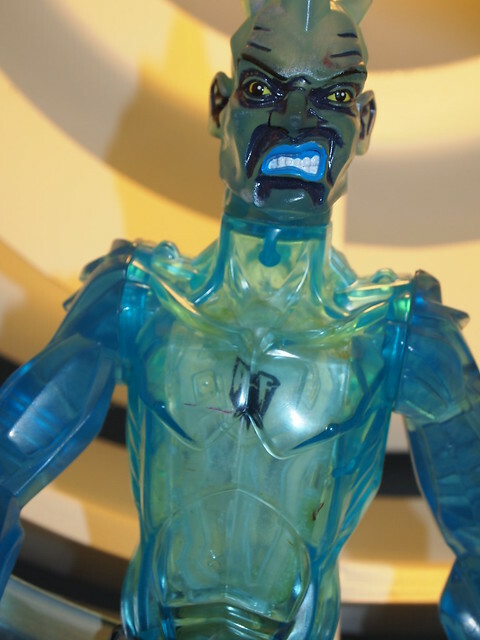 So first up: 2002 Hasbro international 12-13", clear blue plastic figure. 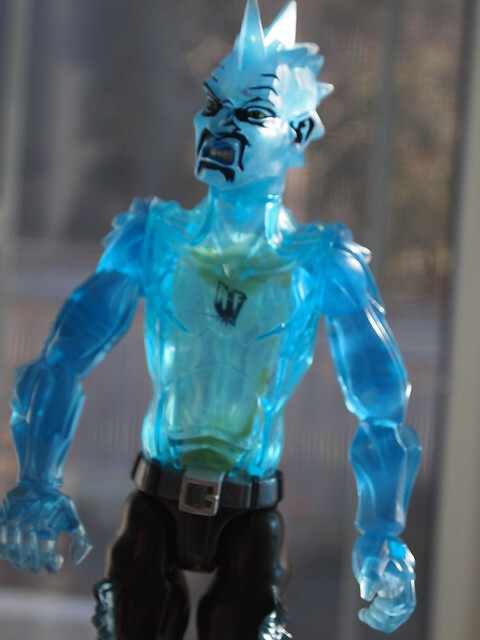 looks to have a feature like Mutagen Man (how weird is that? ), push his belt buckle and something looks like it would happen to his insides? bubbles or something, I dunno. Something looks like it's dried out. 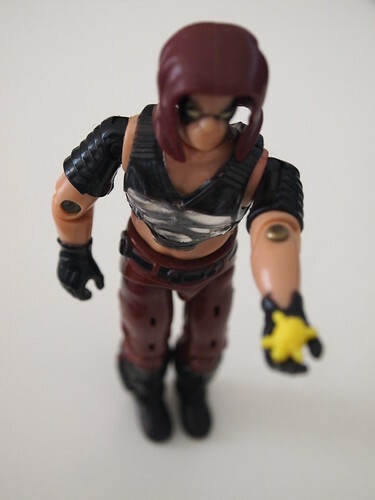 Kinda neat figure. Next is a smaller than 3 3/4 (I'd say 3") figure made by ERTL. Looks like that guy from Dallas tv show. 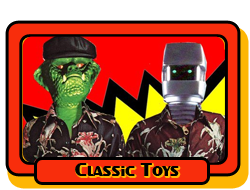 didn't know ertl made some many action figures, I've never seen most of the lines (Fall Guy?, really?). 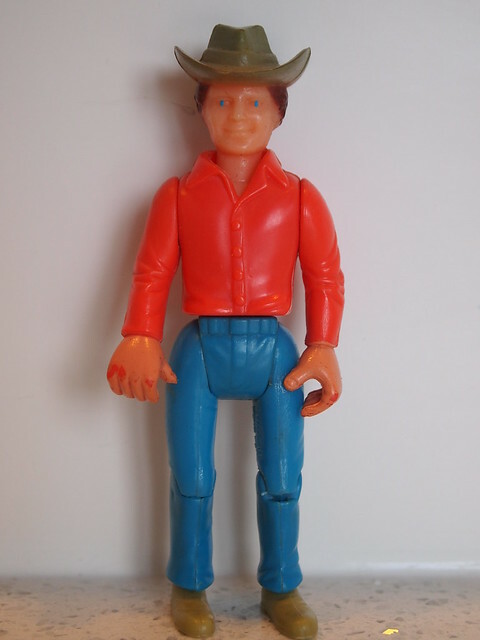 EDIT: Mystery solved he is from The Alamo Quarter Horse Farm Set from 1983. Last edited by 4NDR01D; Feb 9, '12 at 12:38 PM. OK everybody, if your looking for MM/PS cards read this here. I'm gonna take a guess and say that the big blue guy is from Action Man...I'll try to get a name....The little guy, no clue...Wrangler? anti-freeze from Action man. Good call, pm your addy and I'll get some cards out to ya. see how easy it is folks? Last edited by 4NDR01D; Feb 8, '12 at 10:14 PM.